Sergei Nakariakov has broken through more than a few of the perceived boundaries framing the world of the trumpet in classical music. Dubbed "The Paganini of the trumpet" by the Finnish press after a performance at the Korsholm Festival when he was only 13 years old, and in 1997 "Caruso of the Trumpet" by Musik und Theater, Sergei has developed a unique musical voice, which is, much more than a vehicle for astonishing virtuosity. His repertoire includes not only the entire range of original literature for the trumpet; but is continually expanding into broader territories, including many fascinating transcriptions, while he searches for ever new means of musical expression. At the same time, he has single-handedly brought the flügelhorn to prominence on the concert platform. Born in Gorky in 1977, Sergei began to play the piano when he was six years old, but moved on to the trumpet, after a spine injury in 1986 curtailed his piano studies. In the early years, his father tirelessly sought various trumpet teachers, however Sergei pays tribute to the technical and musical gifts he has learned from his father, Mikhail Nakariakov, who has transcribed a large repertoire of classical concertos for the trumpet - and with whom he studied daily from the very beginning, and since 1995 exclusively. From the age of ten Sergei started to perform with orchestras in major concert halls of the Soviet Union. In 1988, he got a diploma at a brass competition for adults. It became clear that in order to develop his carrier and to travel, he had to leave the Soviet Union. His family made the decision to move to Israel in order to give him the liberty to travel. In 1991 he enjoyed great success at the Ivo Pogorelich Festival in Bad Wörishofen. 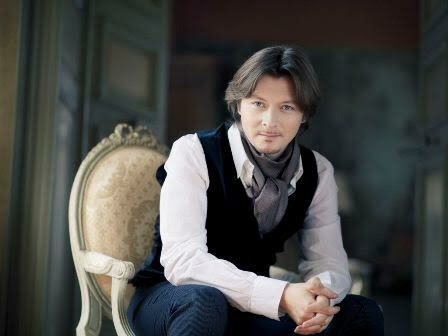 In August of the same year he made his debut together with the Lithuanian Chamber Orchestra at the Salzburg Festival. One year later 1992 Sergei was a guest at the “Schleswig - Holstein Musikfestival” where he was awarded the "Prix Davidoff" . Since then he has appeared in many of the worlds leading centers of music, including the Hollywood Bowl in Los Angeles, the Lincoln Center in New York, the Royal Festival Hall and the Royal Albert Hall in London. He is collaborating with the world's most feted musicians, orchestras and conductors, most recently in Paris at the Théâtre des Champs Élysées with the St.Petersburg Philharmonic and Youri Temirkanov. His international touring schedule includes performances in the foremost concert series all over the world, both with orchestra and in recital - accompanied by his sister pianist Vera Okhotnikova or Belgian pianist Maria Meerovitch. In 2002 Sergei Nakariakov received the ECHO Klassik Award on ZDF as instrumentalist of the year from the German Phono-Academy. Sergei Nakariakov's discography with Teldec Classics International (Warner) has drawn the most enthusiastic public and critical acclaim; and incorporates the most famous trumpet concertos as well as two recital albums of virtuoso music for trumpet by Bizet, Paganini, de Falla, Gershwin and Rimsky-Korsakov with pianist Alexander Markovitch. The "Élégie" recording, with pianist Vera Nakariakova, includes a selection of famous romantic works for voice and piano transcribed for trumpet and piano. "Concertos for Trumpet" features transcriptions for trumpet and flügelhorn of string concertos by Haydn, Mendelssohn and Hoffmeister. The French magazine: "Repertoire" gave it the highest classification: "R10 - Coup de foudre". "NO LIMIT" was awarded the RTL d'Or. "From Moscow with love" features Russian Concertos. His most recent CD is “Echoes from the past”, with trumpet concertos originally written for bassoon and violoncello, written by Hummel, Mozart, Weber and Camille Saint-Saens. In Japan he appeared in a romantic film production impersonating a Russian trumpet player: “Taiga-no itteki” and also played in the soundtrack of the film. In 2006 Sergei Nakariakov premiered “ad absurdum” with Munich Chamber Orchestra, a concerto specially composed for him by Jörg Widmann, which features his unusual circular breathing capabilities. He later performed “ad absurdum” with the BBC Symphony Orchestra and Jiri Belohlavek at the Barbican in London. Sergei Nakariakov has served as a member of the jury for “BBC Young Musician of the Year 2006” Competition at Newcastle Gateshead in England. In 2009 he premiered the trumpet concerto "PIETA" by Christian Jost dedicated to Chet Baker, with the Philharmonic State Orchestra Hamburg in the Laeiszhalle. Sergei Nakariakov plays instruments by Antoine Courtois Paris.